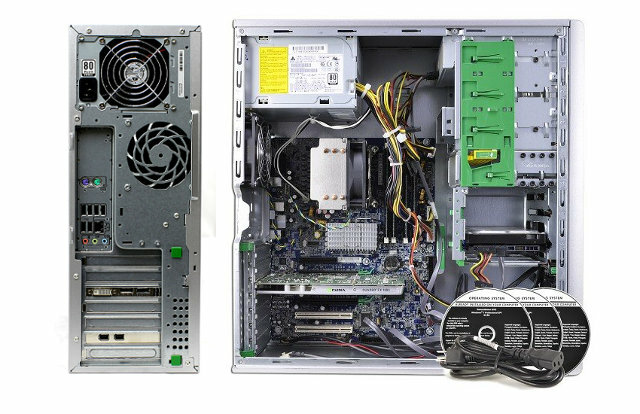 Recently I was in the business of replacing one of my machines at home (all running Linux by the way), and while I had initially considered simply replacing parts at first, I became aware through various channels of the availability of good and cheap HP workstations on the market these days. The HP Z400 line, used mainly by some corporations for various purposes (design, video edition, rendering, etc…) is progressively being replaced by newer models and there’s now a bunch of them available for very, very reasonable prices in about every major location. No surprise since HP is one of the worldwide PC leading manufacturers, pushing high volumes in many markets. a heavy (it won’t move! ), very sturdy tower, well designed. 2 bays for hard drives, and 3 bays for other peripherals (5.25 inches). The Xeon part was the most attractive piece of hardware when I started looking at HP Z400. Xeons are not consumer grade chips, they are their corporate equivalents. They come with at least 4 cores and have a lot more cache than their i- little brothers. And more importantly, they are also capable of hyper-threading. All in all, for an i7 of the same generation as a Xeon, you’ll be faster in single core operations and significantly faster in parallel ones. lower power consumption for any recent i7. DDR3 1600 is supported on the i7, but not on the Xeon (DDR3 1333 max). It comes with integrated graphics while the Xeon has none. Overall the more recent i7 is faster in single core performance, but we are talking about something like 20~30% difference. In multicore benchmarks they are not that far from each other all things considered. But the most important thing is the cost. Such an i7 costs more than 300 dollars for the processor alone, while you can get for this kind of price the whole HP Z400 workstation with tons of RAM. Mine came with 24 GB equipped and that alone made it almost “free” to purchase considering the cost of RAM these days. It’s not the latest generation of RAM (HP Z400 only supports DDR3-1333), but it will do the job nicely anyway. My HP Z400 workstation came with liquid CPU cooling – making for a very silent workstation even under 100% CPU load. Much better than the default Intel fan I had up until now in my previous desktop. So let’s say you can get the whole HP Z400 workstation with a W3690 Xeon at around 300 USD or less. You can add to it a cheap graphics card, such as the GTX1050Ti for 150 dollars (new), while I opted for a GTX1060 3GB, that you can get for 199 dollars new – the difference of 50 dollars is totally worth it in this particular case. 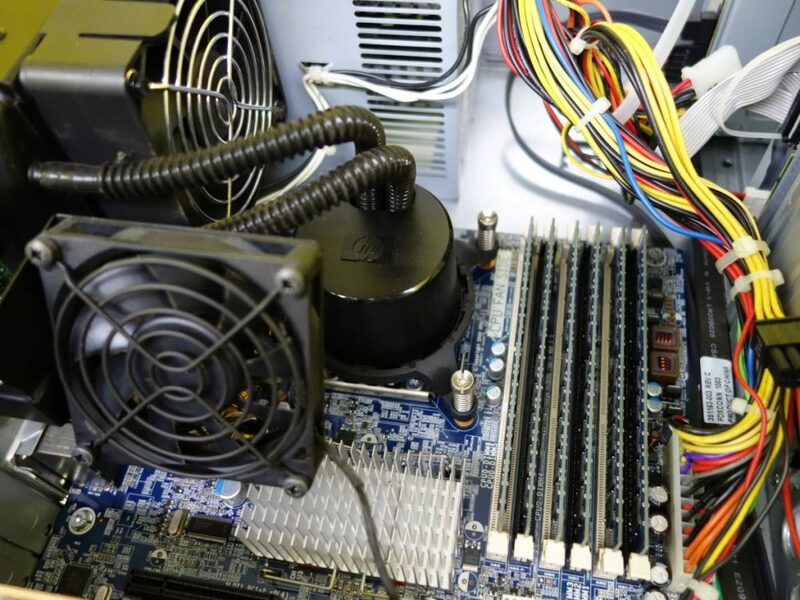 The PSU of the HP Z400 (rated 485W) only comes with a 6pin connector to supply power to the GPU, so it’s highly recommended you go for the Pascal generation of cards which have low consumption. For storage, you can throw in a 50$ 7200 rpm 1TB hard drive for good measure. So you end up with a configuration that costs only about 550 dollars (or less) and that’s a really powerful gaming machine. On Linux, with that configuration, I can get F1 2017 run at high settings in 1080p at constant 60 fps, and even more demanding games like Tomb Raider 2013 get about 72 fps on average in high settings in the benchmarking mode. The benchmark of Metro Last Light Redux shows this configuration will run at more than 70 fps on average as well (very high settings, 1080p, SSA Off). It’s very likely you’ll be able to fun any modern game at 60 fps in medium/high settings, if not better (based on the performance of each game in the first place). All in all, a very good option for gamers thinking about renewing their gaming configuration without spending too much. It’s definitely cheaper than buying a new motherboard, a new CPU, change your RAM type in the process… and it makes for a great desktop experience as well, with the Xeon really making a huge difference in any parallel work, such as compression/encoding tasks. HP’s tower is very well designed as well, no screws are needed to insert or remove parts (latches replace them) and since it’s a custom tower it’s slightly narrower than a typical ATX one. Expect to get more benchmarks on this Xeon/GTX1060 combination from now on. I have a z400 with a w3550 and a gtx 1060 6gb. I really wonder how much faster I.e. more fps I could get when upgrading to a w3690. Do you own any game with a benchmark mode? If i have it too we can compare our results so you can know. I have a couple of games like gta5 and hl2tlc as well as some synthetic benchmark tools like unigine superposition and cinebench. Would you like to exchange email addresses? Sure, sorry for the late reply. I will contact you shortly. Sorry about the delay. All of the notifications went to my Junkmail folder. It has the Xeon W3530 2.8 GHz, 24 GB RAM, 1.5 TB HD, and the FirePro V5800 video card. Good to know! I’ll have to check on getting one! I came across one Z400-W3680/12GB RAM/256GB SSD. Although here in Europe these surplus WS’s are not as cheap as in the US (and definitely NOT for free, unfortunately!) the price is still very competitive compared to a new home-brew of equal performance. And you’ve just confirmed that Z400 will make a good upgradable base for a gaming PC. Look for W3680 or W3690 hexacore Xeons as these have unlocked multipliers and can be easily overclocked with Intel XTU, Throttlestop, etc. These come with AIO coolers & won’t need aftermarket coolers for 4GHz OC. Tһis is a powerhouse! CPUs? We are right here to aid! Do you have CPUs for sale? £250 for the X5690 is WAY too expensive! For these money you can buy the whole workstation, with RAM, HDD/SSD and WITH THIS very processor. You can get the much newer HP z420 with a six core Ivy Bridge E3-1650 v2 for around $350 on eBay. I bought one and I can attest to it being a beast. Nice 🙂 Apart from the Xeon difference, is it similar to the Z400 in terms of internals? I also use a Z400 for gaming. W3550 CPU and a GTX1080 GPU. Was using an HP XW9400 workstation before this one and was also having good results. I’ve yet to find a game where my hardware is the bottleneck. Sure, the CPU is holding some games, like the Witcher 3, back a little. But as long as I can turn every setting up to Ultra and enjoy more than 30fps I’m content. Plowing through Doom 2016 at the moment and having a blast. Yes you will need a new PSU, because the 1080’s consumption requires more power than the default PSU can provide. In my case I did not need a larger PSU (I purchased a GPU that was low-power), so I am not sure whether buying an extra fan will remove the message. I got myself a really big (I think 120mm) fan and used tie wraps and some isolation foam to attach it to the bottom of the hard drive bay, so now it blows gently towards my gpu while sucking in fresh air.. I ended up also having to spring for the bigger PSU. The machine ended up crashing in Nier Automata and Dragon Quest 11, turned our the original 485W PSU just wasn’t up to the task. I upgraded to the 600W version and indeed, I’m getting the same prompt concerning the front-fan not working. Hitting F1 isn’t a big issue for me, but I wonder about the long-term consequences..maybe I’ll have to get the front-fan assembly you’ve linked to on Amazon.